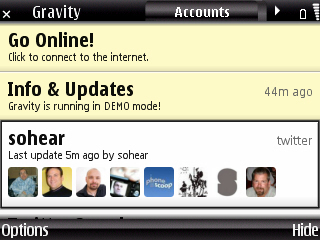 Gravity is supported on phones running S60 version 3, including my own Nokia E71, as well as the latest touch-friendly S60 version 5, which powers the Nokia 5800 (aka the Tube) and the upcoming N97. I recently hailed Spotify as my streaming music service of choice but bemoaned the lack of a mobile version. That’s set to change, reports my friend Mike Butcher over at TechCrunch UK, with a working version for Apple’s iPhone and iPod touch already in existence – though not yet publicly available through the App Store – along with a Symbian S60 version in development. Interestingly, Butcher says that it’s rumored that the iPhone client will only be available to users who use the paid-for version of the service, which is certainly one way for Spotify to sell more subscriptions. Right now the audio ads that persist on the free version of Spotify aren’t intrusive enough to make me want to switch to the paid version, but adding more value through a mobile client could make the difference. Especially if playlists can be ‘cached’, as Butcher suggests, so that you’ll still be able to use Spotify on the go even when you’re without a wireless connection. This will also help to save on battery life too, which can an issue with any mobile streaming service, not just Spotify. After viewing a video demo of Spotify running on the iPhone (which has since been yanked from YouTube), Butcher says that, with the addition of a mobile client, the service “could even give the iTunes store a run for it’s money”, since it gives instant access to millions of tracks. “Assuming Apple lets it into the App Store of course”.